Forget the bland rice cakes and limp lettuce leaves, and discover wonderfully delicious – yet nutritious – lunches. Whether you want to make something to pack up into a lunchbox or picnic basked, a quick meal to revive you in the middle of the day, or something to enjoy with your friends and family, you’ll find a mouth-watering selection here. Celebrate asparagus season with this wonderful recipe.! The clean, sharp tastes of the chilli and lemon combine with the herbs and seafood to make a seriously good dish. 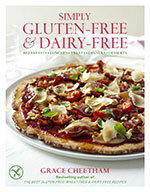 A crunchy-based pizza topped with shavings of dairy-free cheese. A thick, creamy pate – without any dairy! A hearty, creamy soup with a spicy kick. 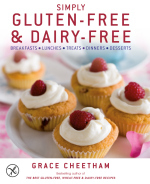 This tart is taken from my new book Simply Gluten-Free & Dairy-Free. It might look hard – but it’s actually incredibly simple to make. Simple and utterly stunning!